A weekend with the girls has the potential to get really messy, there are so many things that could go wrong. Countless amount of upheaves could happen throughout the short time that you are together. The excitement might mean the girls will come unprepared for the weekend ahead. As the maid of honor it is your job to see that all of the girls come away from this weekend with smiles. 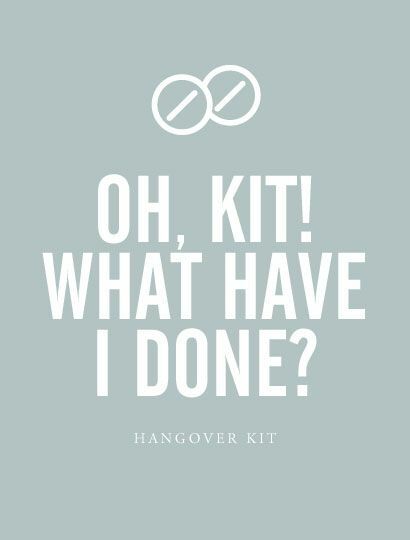 So, why not create a small hen weekend survival kit for each of the girls attending your party weekend? This is something you’re definitely going to need on your weekend. The water will be a god send when you are drunk and dehydrated. Often a bottle of water is the perfect little treat when the room begins to spin after a great night out. Of course it is only to be used if there are no other sources of water; after all, it’s only to be used in the event that survival becomes questionable. Of course you are probably going to need to sober up before doing anything that required motor skills in the morning. A can of ice coffee or re bull should do the trick. Adding their preferred pick me up will be a great touch for the weekend, the girls will thank you for this, for sure. Your motor skill won’t be the only thing suffering in the morning, providing you drank the water provided, your headache shouldn’t be that bad, but in case of emergencies ‘break’ open the seal of those pain killers and let’s hit the road. After all a hen weekend isn’t all about partying, you have things to do in the day time too. Ahh, a girl’s best friend. When all the fun is simmering down and your thoughts less alcohol and music related, the faint voice of temptation speaks up, chocolate is just what you need to silence it. A nice piece of chocolate before bed is a great touch to end an amazing night out with the girls. Not sure if it’s a survival item, but it is really tasty. For the nights that might get a little breath mints or quick sprits of a spray should do it. Also, when you wake up after a messy night and you aren’t ready to get up but you’re definitely ready to talk about what went on last night, a cheeky spray should do it. Because all girls nights out have the potential to end with at least one casualty. Plasters are definitely needed just in case. On a girls night out, a box of plasters could be what decides whether your troops carry on partying or go home with the wounded solider. Breaking at least one nail it a requirement on a great night out. But of course you will need to doctor it, nail files are a must for a girls night weekend. Just a little something with big impact, a dodgy nail on a hen weekend is something no lady wants and it is something that can very easily be avoided. For your last evening of the weekend, a face mask is essential; it should definitely be a survival item on your hen weekend. It is a very special day in the morning, a face mask is just what you need to revitalize after a long weekend of partying. And there we have it, a complete survival kit, for everyone to take with her on the hen weekend. Remember, you can never be too prepared. Hope this helps!